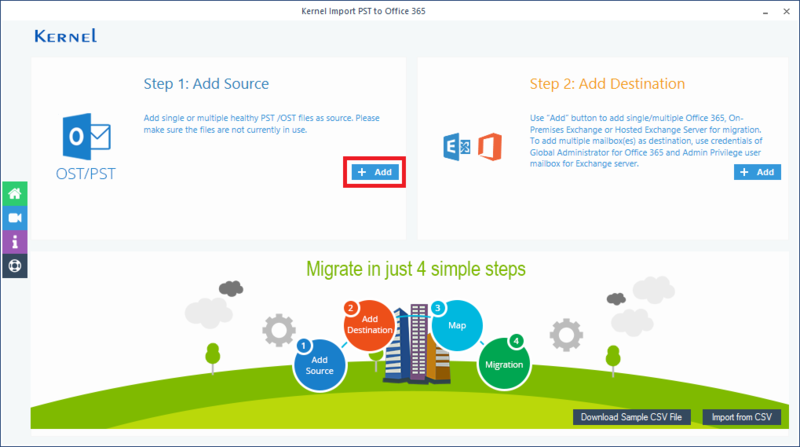 How Kernel Import PST to Office 365 Software Works? 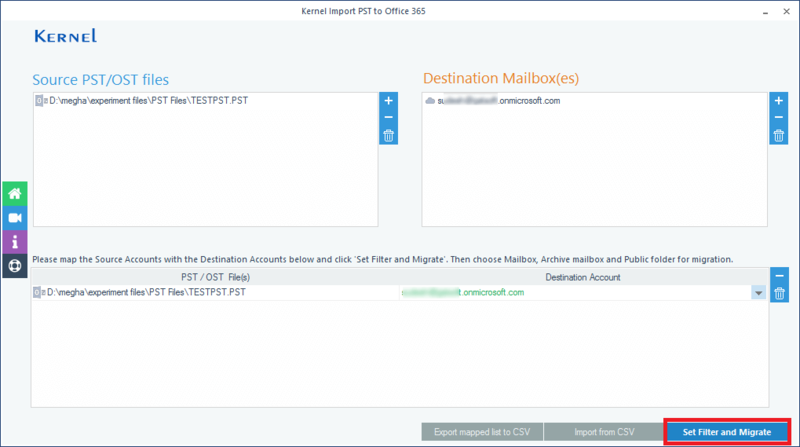 How Kernel Import PST to Office 365 Works? Kernel Import PST to Office 365 is the best solution when you want to import PST files to Office 365, Exchange (both on-premises & hosted). 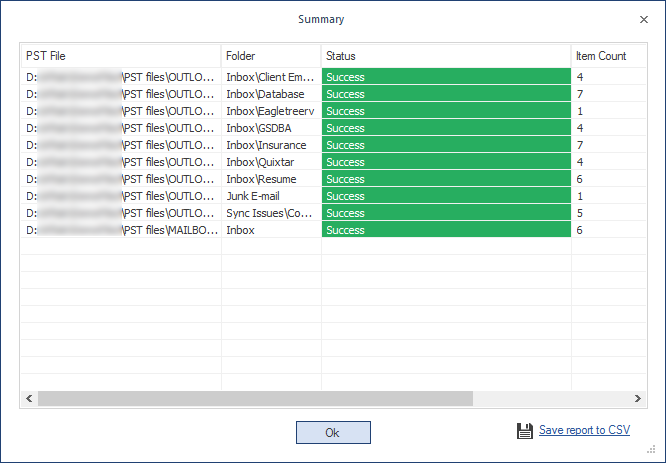 The tool allows you to import PST files to single/multiple Exchange or Office 365 mailboxes simultaneously. 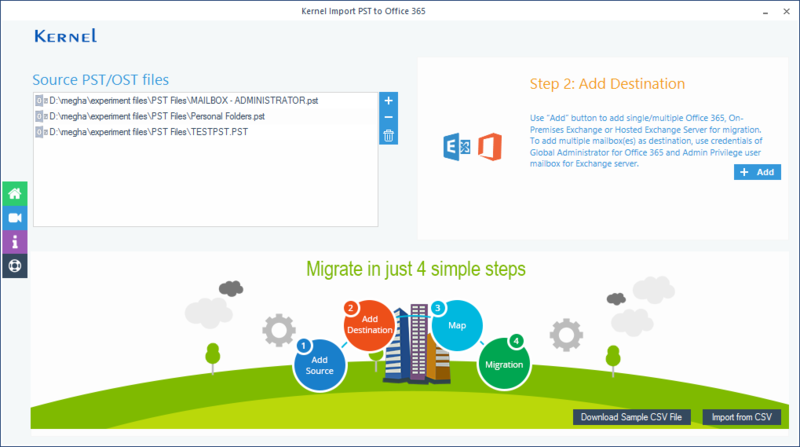 Kernel Import PST to Office 365 tool is useful for Office 365/Exchange end users as well as administrators as it supports migration to single or multiple mailboxes of the destination. 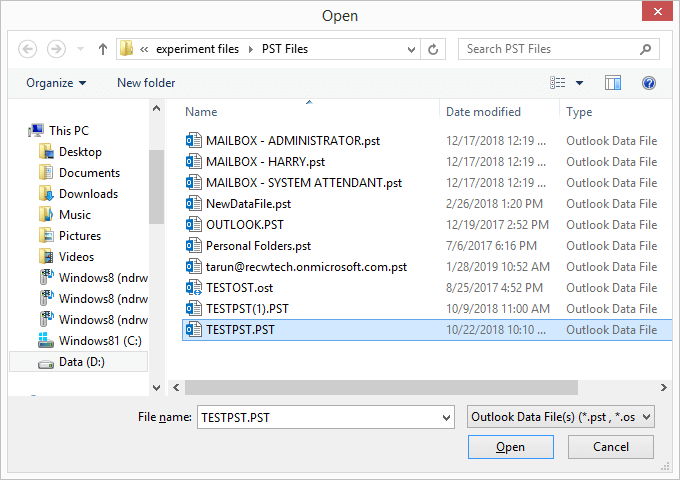 Any Office 365/Exchange user can import PST or OST files into his mailbox using this option. Launch the Kernel Import PST to Office 365 tool. Click the Add button in the Add Source section. Browse and select the desired PST or OST file(s). The selected file(s) will be added under the Source PST/OST files section of the software. Now, click the Add button in the Add Destination section. For Office 365 as destination, enter Office 365 Mailbox Login ID (UPN) and Password. For hosted Exchange as destination, enter hosted Exchange proxy server name, Mailbox Login ID (UPN) and password. For on-premises Exchange Server as destination, enter Exchange Server name, Mailbox Login ID (UPN) and Password. Now, select Single/Archive Mailbox, and click Add. Note: If your email address is different from the Mailbox Login ID (UPN) in the Active Directory, then you need to enter the email address as well. Note: Here, we are showing the migration to Office 365. The procedure is same for all migrations. 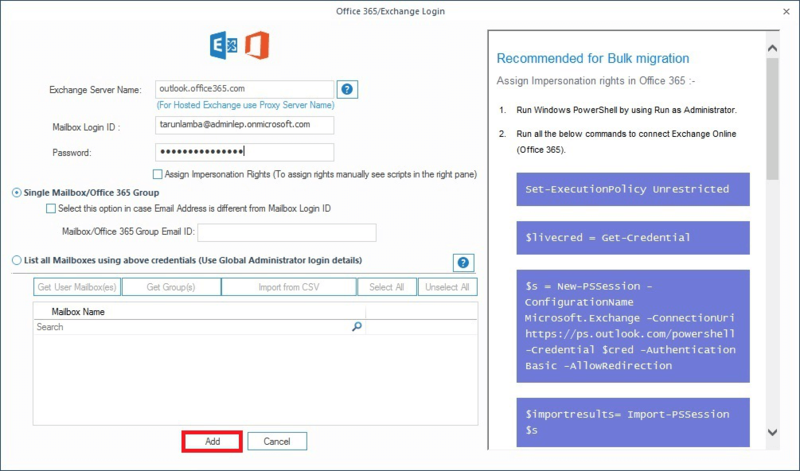 The source (PST/OST file) and destination (Exchange/Office 365) gets added. 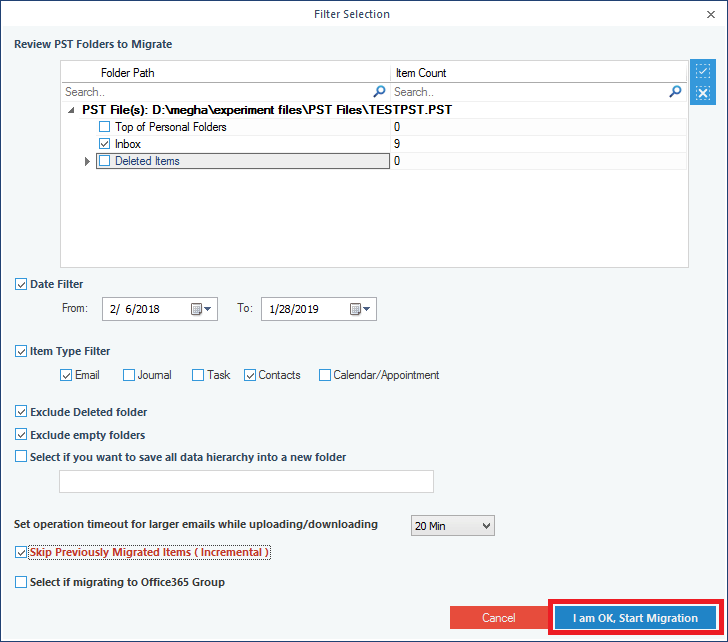 To map the PST/OST file to the Exchange/Office 365 mailbox, select the required mailbox under the Mailboxes section (under Mapping of Source and Destination). Then click the option Set Filter and Migrate. 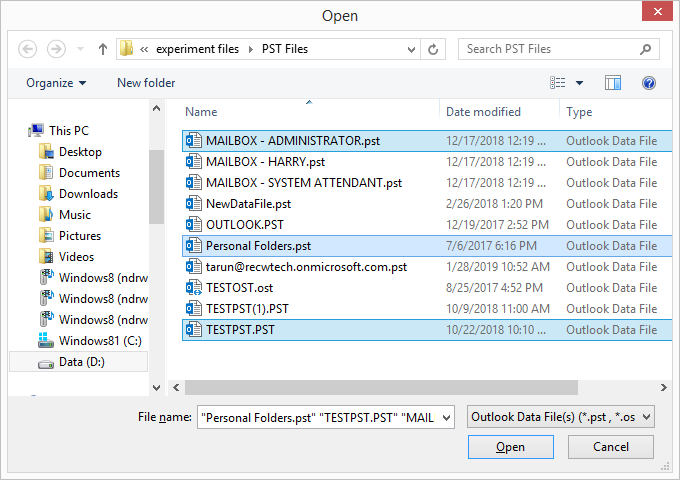 Note: Now, you can add or remove PST files, Office 365 mailboxes, or mapped Office 365 mailboxes using the Add, Remove Selected, or Remove All buttons. 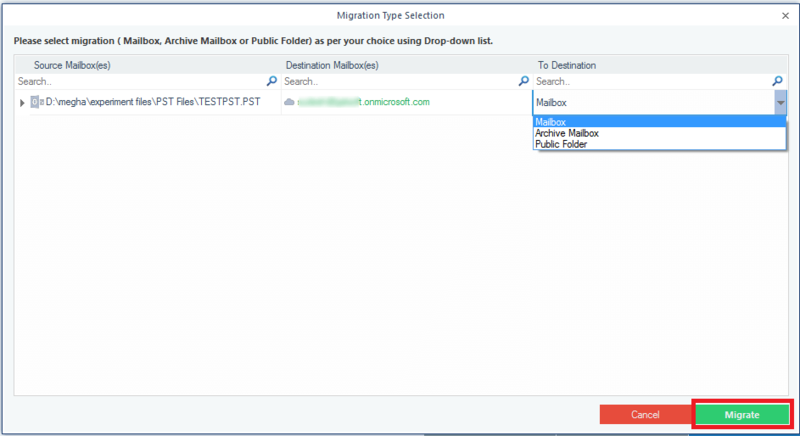 In the Migration Type Selection dialogue box, select desired destination option Mailbox, Archive Mailbox, or Public Folder and select Migrate. Note: The Archive Mailbox option will appear only if archiving has been enabled for the mailbox. Note 2: The Public Folder option will appear only if the mailbox has the rights to access the public folder. 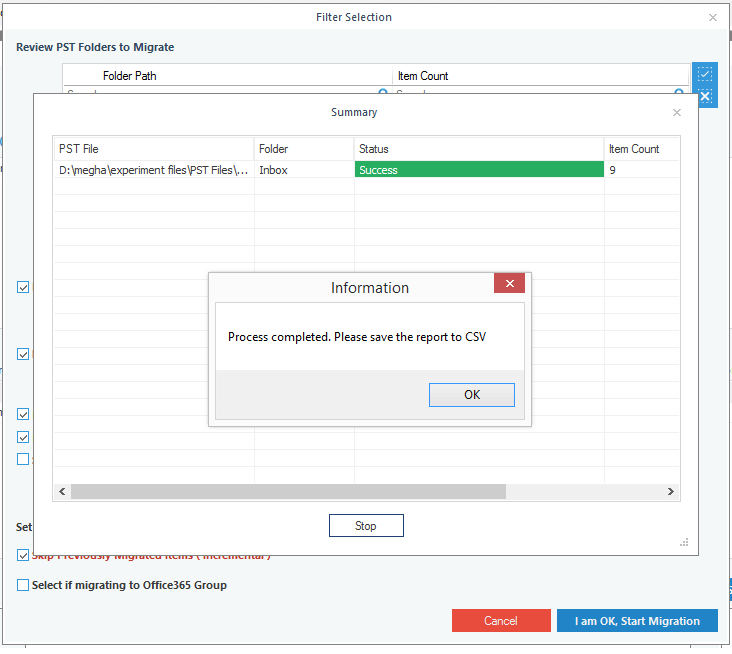 Review PST Folders to Migrate – Select the folders to migrate. Set operation timeout – Select an upper time limit for migration (the migration will be rejected if it exceeds this time limit). Skip Previously Migrated Items… – Check the box to exclude the already imported data. As soon as the migration process finishes, a Process Completed window appears. Click OK to finalize the process. 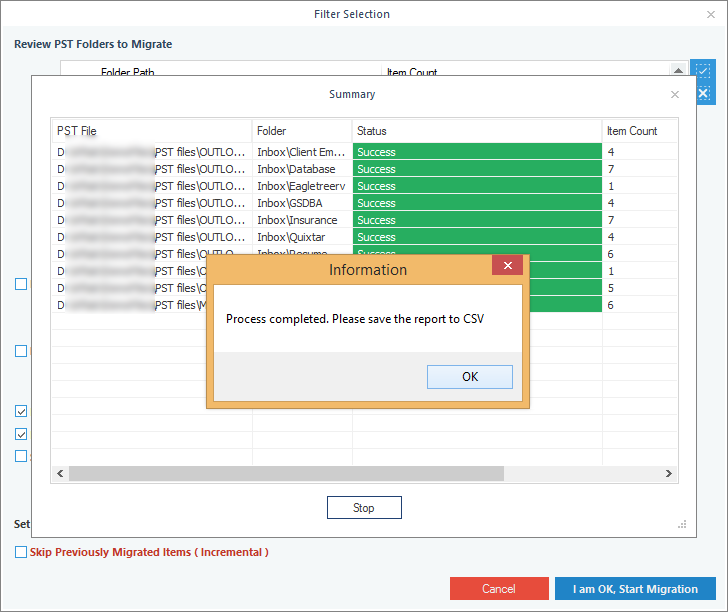 Note: To save the migration report, select Save report to CSV. 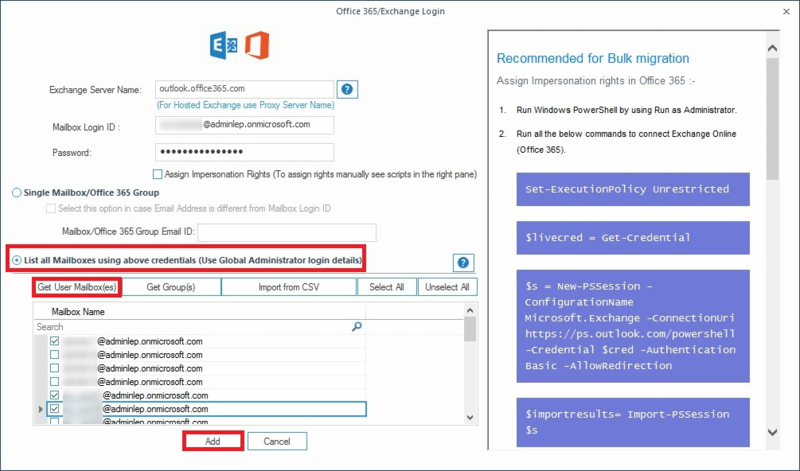 Using an Office 365/Exchange account with Global administrator credentials, you can import PST files into multiple Office 365 mailboxes. Launch the Kernel Import PST to Office 365 and click the Add button (in the Add Source section). Browse and select the desired PST or OST file(s). Now, click the Add button (in the Add Destination section). 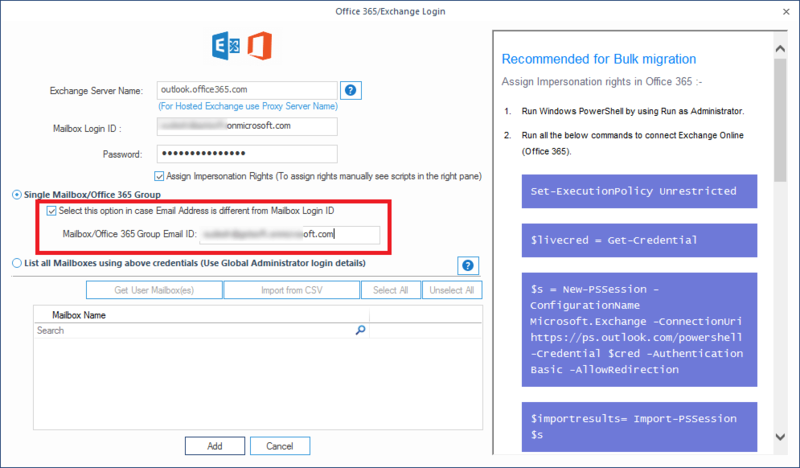 In the Office 365/Exchange Login Sign in window, enter the login credentials of Office 365 account or Exchange (hosted/on-premises) account, whichever is required. Select List all Mailboxes using above credentials click Get User Mailbox(es). 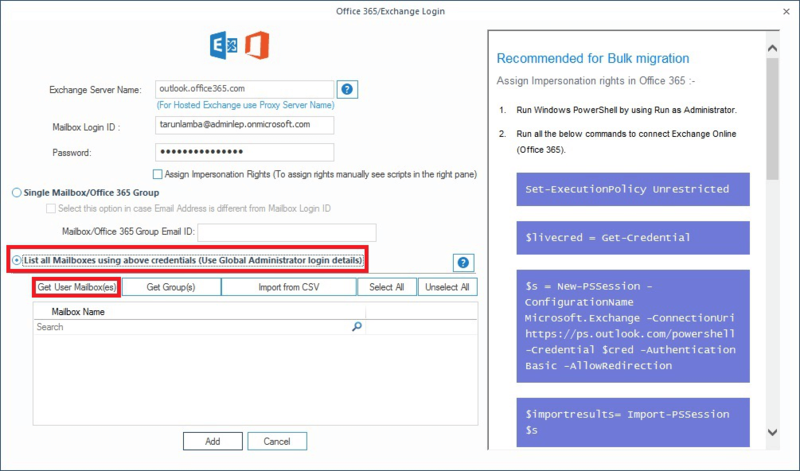 Note: To migrate to multiple mailboxes, you should use an Exchange/Office 365 account with Global administrator credentials. When all the mailboxes are displayed, select the required mailboxes and click Add. 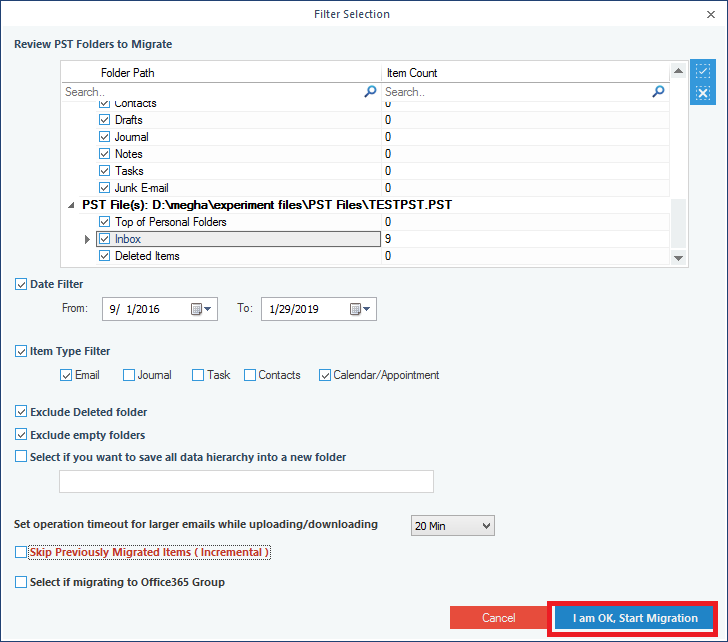 To map the PST/OST file to the Office 365 mailbox, select the required Office 365 mailboxes against the PST files. Then click the option Set Filter and Migrate. 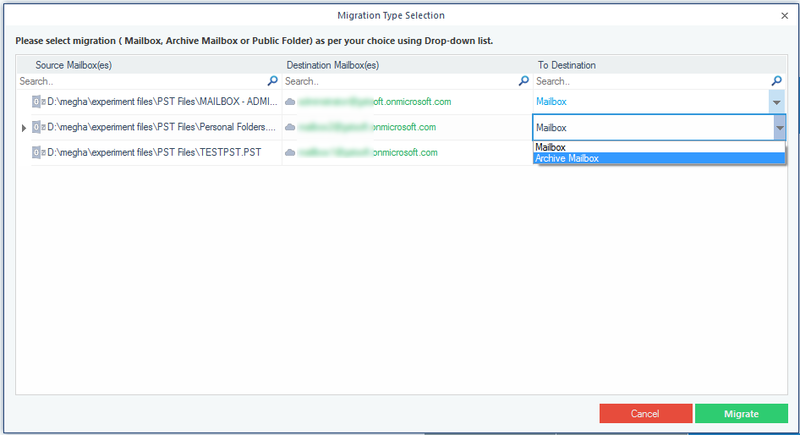 In Migration Type Selection dialogue box, select desired destination option Mailbox, Archive Mailbox, or Public Folder and select Migrate. Date Filter – Enter a date range to filter items. Exclude empty folders – Exclude folders without any items. Set operation timeout… – Select an upper time limit (the migration will be rejected after this limit). Skip Already Migrated Check the box to exclude the already imported data. Then, click I am OK, Start Migration. When the Process Completed window appears, click strong>OK to finalize the process. Note: To save the report, click strong>Save report to CSV. Provide a new name and save it. 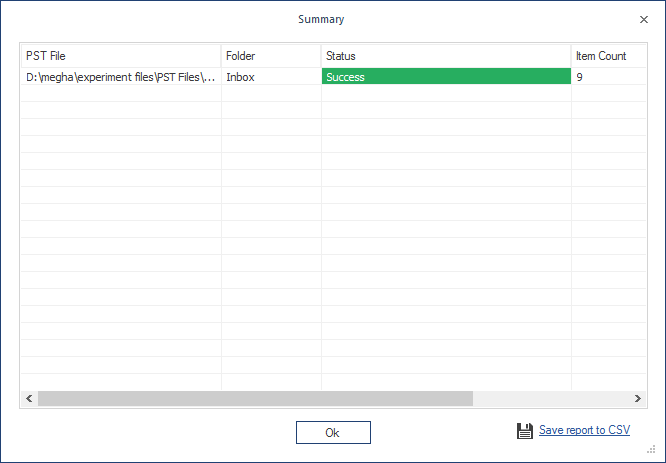 You can import PST files to multiple Office 365 mailboxes with the help of a CSV file. 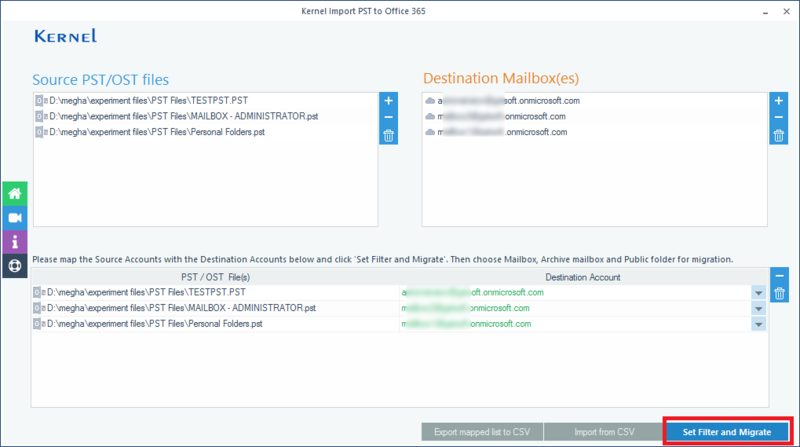 Launch the Kernel Import PST to Office 365. Click Download Sample CSV File and download the sample CSV file. Enter the details in the sample CSV file Source PST File(s), Destination Mailbox, Login account, and password. Now, click Import from CSV (see the diagram in Step 1). Browse and select the CSV file (with the details of PST files and Office 365/Exchange mailboxes).